ARCANUM – The Arcanum-Butler Local School District is planning a Veterans Day assembly for 1:30-2:30 p.m. Nov. 12 in the high school gymnasium. Local veterans are encouraged to attend this assembly and seat down on the gymnasium floor in front of the podium. This year’s assembly speaker is Lt. Luke Marshall, a 2002 graduate of Arcanum High School. Following the assembly, there will be refreshments for veterans and their families in the cafetorium. Marshall was born and raised in Dayton. He graduated from The Ohio State University in 2009 with a Bachelor of Science in personal financial planning. He commissioned out of Officer Candidate School in Newport, Rhode Island in March 2011. He checked into USS Vicksburg (CG 69) in June 2011. He served as the tomahawk strike officer during Vicksburg’s 2012 deployment as a part of the USS Enterprise CSG to the Fifth Fleet AOR in support of Operation Enduring Freedom. Marshall extended onboard Vicksburg and served as the ship’s training officer. He served as the assistant operations officer during Vicksburg’s 2014 Standing NATO Maritime Group 2 Flagship deployment in the Sixth Fleet AOR. 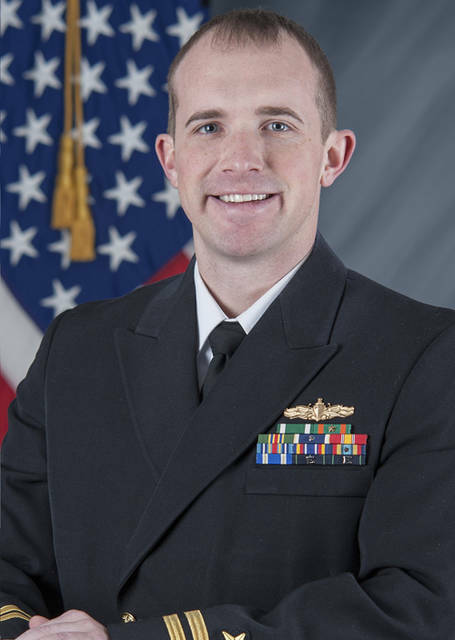 He is currently stationed at the Naval Reserve Officer Training Command at The Ohio State University as an assistant professor of naval science, teaching navigation and naval operations to midshipmen. He received orders to report to the USS James E. Williams (DDG 95) as the operations officer. Marshall’s awards include a Navy Commendation Medal, two Navy Achievement Medals and various unit awards. He is married to the former Amy Factor, and has one son, Joey (8).